The CMA CGM MARCO POLO headed for the Mediterranean and the Malta hub at the end of its tour of the ports of Northern Europe before setting course for China. The vessel then paused for 4 hours in order to participate in the exercise. The exercise began at 10:00 with the helicopter winching off ten staff from CMA Ships and the French Navy, and at 12:30 two people were transferred onto the container vessel from the Abeille Bourbon by Fast Rescue Boat. 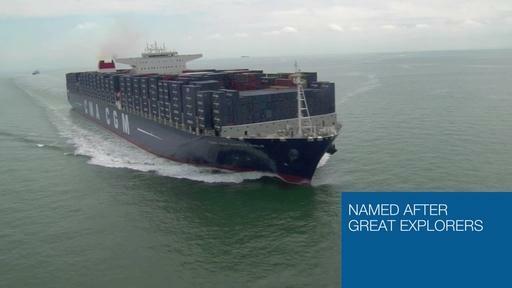 The CMA CGM MARCO POLO simulated an Engine Propulsion failure and took up a position beam on to the wind. Her large wind profile ensured a rapid drift of approximately 1.5 to 2 knots. The Abeille Bourbon then began its rapid towing maneuver. The tug approached before throwing her line and have it fast on board of CC Marco Polo. This is a dangerous maneuver in bad weather because the ships involved need to be close to each other. The exercise validated the efficiency of the emergency towing system, SMIT BRACKET, situated on the prow and the stern of the CMA CGM MARCO POLO. Despite the 12,144 M² of wind-exposed hull of the vessel, the Abeille’s and Marco Polo’s crew took only 20 minutes to make fast this giant of the seas, and the towing operation began at 13:30 with the Abeille Bourbon setting a speed of 6.7 knots. The Abeille Bourbon stopped towing at 2 PM, and the towline was cast off one hour later. The operations had lasted for over 4 hours. “The crews of the CMA CGM MARCO POLO and Bourbon as well as the Navy and evaluation teams cooperated well and the operation was carried out safely. This exercise will supply us with useful feedback which will help us to to improve the safety of vessels off the French coast” said Dominique Balmitgère, Deputy Vice President SSE.